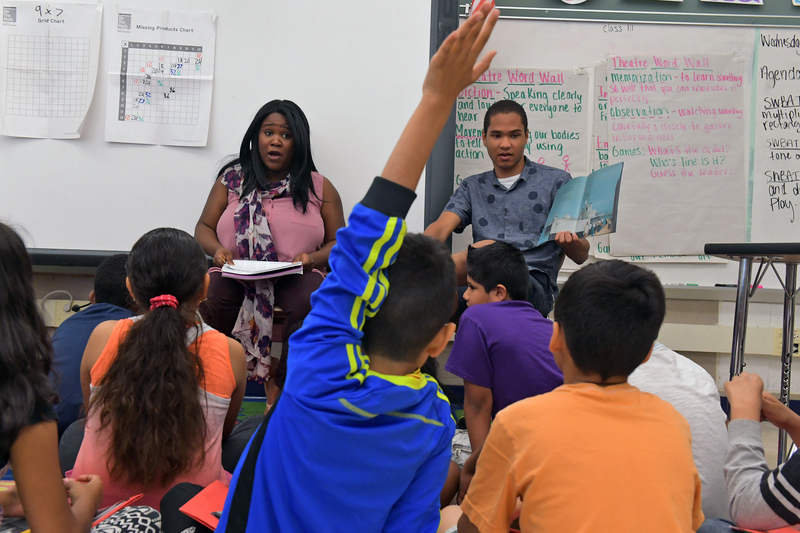 The number of students living in poverty has been rising in the Washington suburbs, and leaders in Montgomery County's high-performing school system have looked for ways to boost their academic success. "There's a lot of evidence that more time makes a difference in learning progression, and we want to see if we can do that effectively as part of the school year," Montgomery County Schools Superintendent Jack Smith said in an interview Wednesday. The initiative comes as another sign of increasing diversity in a school system once regarded as largely affluent and white. Now, more than 55,000 of its students are from low-income families — about 20,000 more than a decade ago. Enrollment in the state's largest school system is 32 percent Hispanic, 28 percent white, 21 percent black and 14 percent Asian. Details of the plan are being worked out, but officials say it would add four to five weeks to the school schedule, blend experiential learning with classroom instruction and involve changing the curriculum across the school year. It would start at two Silver Spring schools — Arcola Elementary and Roscoe Nix Elementary — and be expanded in two to three years if results warrant such action. "We think it's an excellent idea and much, much needed," said Diego Uriburu, a longtime community leader and executive director of Identity Inc., a nonprofit organization that advocates for Latino youths in Montgomery County. "It is something that was needed years ago." Smith and others say the idea is to stave off "summer learning loss" and narrow achievement gaps that leave poor students lagging on measures of academic performance. Research shows that students from low-income families regress in math and reading during summer months. "I really do believe that a strategy for the achievement gap is more time in school," Board of Education member Patricia O'Neill said. "More time is better, especially for at-risk children." Montgomery has had summer programs designed to help disadvantaged students, including one run by the nonprofit BELL (Building Educated Leaders for Life). Montgomery district officials say it has produced strong results, and they are doubling its enrollment for summer 2018 to 2,100 seats. But Smith said the district is also seeking more durable solutions that will not fall away if grants evaporate or funding dwindles. "At what point are we going to say that at least the schools most impacted by poverty need more time and it needs to be built in forever, not based on a grant?" Smith said, describing conversations top officials have had for the past year and a half. Nationally, large urban districts have experimented with extra learning time, especially in low-performing schools, as a way to narrow achievement gaps, said Jennifer Davis, co-founder of the National Center on Time and Learning at Harvard University's Graduate School of Education. But many districts have opted to lengthen school days rather than the school year because of cost, she said. "The big issue is time alone doesn't really matter; it's how that time is used," she said. Chester E. Finn Jr., president emeritus of the Thomas B. Fordham Institute, a right-leaning think tank in Washington, who also serves as vice president of the Maryland State Board of Education, said many charter schools around the country have had success with an extended school year and longer school days. "It's a necessary thing for a great many disadvantaged kids because they depend on school for their learning and don't get a great many academic resources in the rest of their lives," he said. Byron Johns, education committee chair of the Montgomery County branch of the NAACP, described the idea as a proven concept with great promise for the county. But strong management and focus are important, he said, and he said he worries about the fallout of county budget pressures this year and in the future. The cost of extending the school year is being determined. "The programs that are there to support the disadvantaged kids will be the most vulnerable because there isn't the same kind of political pressure from the community," he said. Lynne Harris, president of the countywide council of PTAs, said the plan makes sense in a school system that serves the haves and have-nots. Some families can afford pricey tutors or summer programs, "and then we have a huge number of students in our communities who don't have that option," she said. Montgomery officials have begun talks with teachers and other employees at the two elementary schools involved, and meetings with community members are planned for coming months. In neighboring D.C. Public Schools, officials began to experiment with an extended schedule in 2015-2016, a trial that has been expanded to 13 schools at a cost of about $5 million a year, said D.C. schools spokeswoman Michelle Lerner. While student absences shot up during the final weeks of the year — as other schools embarked on summer break — D.C. officials have been pleased with increases on standardized test scores, she said. Garfield Elementary in Southeast Washington posted some of the most impressive gains: a nearly eight percentage points improvement in English across grades three to five after the first year and an improvement of 8.5 percentage points in math, Lerner said. In Maryland, the extended-time plan would require a waiver from a state mandate — issued by Gov. Larry Hogan (R) — that classes start after Labor Day and end by June 15. But Montgomery officials note that the order allows exceptions for innovative schedules put in place at low-performing or at-risk schools. Donna St. George writes about education for The Washington Post, where she has been a reporter since 1998. She previously worked at the Philadelphia Inquirer and the New York Times.